Leaving Rome in southerly direction you take the “Highway of the Sun” crossing the fertile Roman countryside and the area known as “Castelli Romani”. Approximately halfway along the highway you will be able to see the Benedictin Abbey of Montecassino, noted for the famous battle and its complete destruction during the Second World War. Arriving in Naples you will board the jet boat for the 45 minute crossing to Marina Grande, the port of Capri. Here you will then board motorboats to reach the Blue Grotto optional visit (if weather and sea conditions permit). 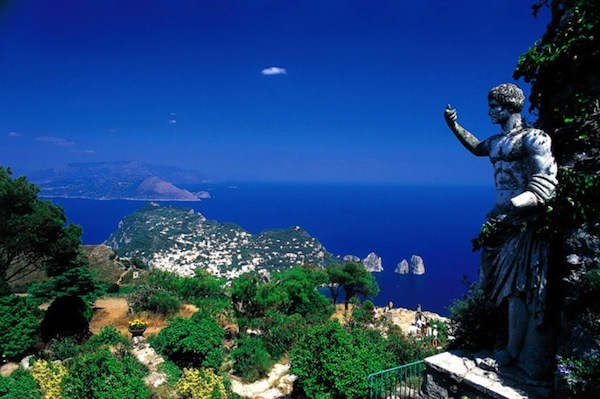 Minibuses are then used for a panoramic drive to reach Anacapri, situated 280 meters above sea level from where you will have a wonderful view of the Bay of Naples. After lunch in a local restaurant, you will have some free time to take unforgettable photographs and purchase local products before returning to Marina Grande to board the boat back to Naples. Entering the port of Naples don’t miss this opportunity to admire the splendid Maschio Angioino (a fortress of the 12th century), the Certosa of San Martino and the Royal Palace. After disembarking you will then take the coach for the return journey of approx. 3 hours, back to Rome. Return to the vicinity of your hotel. USEFUL INFORMATION: During the journey from Rome to Naples, it will not always be possible to make a comfort stop, but the boats for Capri have bar and restroom facilities. We would recommend that you wear comfortable clothes and especially comfortable shoes to assist you when boarding the boats. During high season there may be delays in boarding the boats and minibuses and we ask you to pay particular attention to your guide to avoid getting separated from your group. *NB If the sea conditions are so bad as to not permit the boats to leave Naples to Capri, it will be necessary to substitute this tour with the tour of Pompeii (tour 15) and the difference in price will be reimbursed.